Prime Minister Jacinda Ardern has promised to address New Zealand’s flagging productivity growth. According to the Productivity Commission, the country is being held back by our persistently weak labour productivity growth, which was the fourth lowest of all OECD countries between 1995 and 2014. Productivity, which grows when better use is made of a country’s resources, is the most important driver of income growth and people’s wellbeing. New Zealand’s poor long-run productivity performance is the key reason why our average incomes are still well below the OECD average. To increase productivity, we essentially need to add value to everything we sell. Yet when it comes to exports, we are still largely reliant on commodities. While this is changing, progress is painfully slow. Fonterra, New Zealand’s biggest company, is the world’s largest processor of dairy products, with a total revenue of around $22 billion, 22,000 employees, and a sales network that reaches into more than 100 countries. While their main export remains milk powder, they are increasingly diversifying into added value consumer and food service products such as UHT milk, infant formula, butter, yoghurt, ice cream, and a wide variety of cheese – including their increasingly popular extra stretch mozzarella. The company’s focus is not only on increasing the efficiency of their operations, but on developing new revenue streams, through higher value specialised products. These now make up almost 20 percent of the company’s sales volumes. 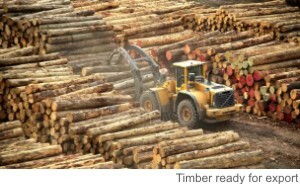 A new development in the timber industry is providing exciting opportunities to add value. Over the years, the 150 year-old Victoria University Law School in Wellington has attracted attention – not only for being the largest wooden building in the southern hemisphere, but because it has come through earthquakes unscathed, while near-new concrete and steel structures have broken under their own weight. This has led Sir Bob Jones to commission the world’s largest wooden commercial building – a 12-storey 52 metres high office block in central Wellington, made from laminated timber columns and beams. Some fifteen hundred New Zealand pine trees will be used in the building, which is expected to perform better in an earthquake than steel or reinforced concrete. The technology, which is now being used around the world, including in Canada, the UK, Norway, Austria and Australia, was used in the extension to Wellington Airport’s domestic terminal. In Melbourne, a 10-level 42 metre building using the same cross laminated timber went up 40 per cent faster than a concrete building, with fewer workers, a quieter and safer building site, and 90 per cent fewer truck movements. The main reason for the faster construction was the prefabrication of the floors, walls and other components. New Zealand played a leading role in that construction. The Nelson-based company Xlam was the only precision manufacturing plant in the southern hemisphere that could supply the laminated timber panels. The company is now setting up its second factory in Australia. Although progress is clearly being made, the scope of our productivity problem is significant. The Productivity Commission says that New Zealand’s leading firms are around a third less productive than leading international firms in the same industry. And when it comes to other domestically focussed firms, they can be up to 90 percent less productive than the best firms in the field, but still survive in the New Zealand marketplace. In comparison, in Denmark, firms that can’t achieve at least a quarter of the productivity of the best firms in the same industry get killed off by the forces of competition. It’s therefore no surprise that Denmark’s productivity is 61 percent higher than ours, and although the Danish work 19 percent fewer hours per person than New Zealanders, their per-capita GDP is 31 percent higher than ours. Transitioning from a development model based on working more hours per capita to one based on generating more value from time spent at work is a key challenge. While there’s no simple formula to lift productivity, there are some universal principles. One is to create a climate in which entrepreneurialism will flourish. That means ensuring open and competitive markets, a tax regime that rewards enterprise, and a regulatory framework that encourages innovation. A country’s culture is also crucial. One that embraces free market wealth creation will obviously be more prosperous than one that considers successful business people to be ‘rich pricks’ – to quote Labour’s former Deputy Prime Minister Michael Cullen. The sad reality in New Zealand today is that over the last few decades left wing politicians and socialist activists have successfully manipulated public opinion into thinking that anyone who has managed to do well for themselves financially has only done so at the expense of the poor and the needy. If Jacinda Ardern really wants New Zealanders to improve their wellbeing she should focus on encouraging business success. That would lift employment and economic growth, and in doing so she would be helping to raise living standards for all citizens. “A shift is required to create a more productive economy. This does not mean increasing productivity through more people working more hours to increase outputs, while eroding our natural and social assets. In the lead up to the election, Labour, the Greens, and New Zealand First all identified Investor State Dispute Settlement (ISDS) clauses as a major barrier to trade deals, especially the TPP. These clauses allow foreign investors to sue governments – either through domestic courts or international tribunals – if they introduce new laws and regulations that breach their rights under the Agreement and undermine the value of their investments. The TPP – which was instigated by Helen Clark’s Government and negotiated by National – has been a major focus for the new Government over recent weeks. During the Asia-Pacific Economic Cooperation meeting in Vietnam, when the 21 APEC leaders met to promote free trade throughout the region, New Zealand was able to get together with the remaining ten TPP countries (Japan, Canada, Australia, Brunei, Chile, Malaysia, Mexico, Peru, Singapore, and Vietnam) to try to finalise the deal, following the withdrawal of the United States. In other words, the only change agreed to – apart from a name change to the Comprehensive and Progressive Agreement for Trans-Pacific Partnership (CPTPP) – was to suspend the clauses that had originally been introduced at the behest of the USA, with the intention of bringing them back into the deal if the US chooses to re-join at a later date. The problem is that the Prime Minister and Trade Minister, David Parker, claimed they had negotiated major concessions – including over those ISDS clauses. While the CPTPP hasn’t yet been signed, there are high hopes that it will be in the near future. Progress has also been made on the Regional Comprehensive Economic Partnership – a proposed free trade agreement between the ten member states of the Association of Southeast Asian Nations (ASEAN) of Brunei, Cambodia, Indonesia, Laos, Malaysia, Myanmar, the Philippines, Singapore, Thailand, and Vietnam, along with the six states with which ASEAN has existing free trade agreements – Australia, China, India, Japan, South Korea and New Zealand. The Minister of Foreign Affairs, Deputy Prime Minister Winston Peters and the Associate Trade Minister Damien O’Connor represented New Zealand at the negotiations, which, if successful would cover seven out of our top 10 export markets. Free trade deals are extremely important to New Zealand, since every extra $1 billion in exports, creates around 8,500 new jobs. Yet, in spite of that, New Zealand only has eight trade agreements with 16 countries – far fewer than most comparable nations. That’s in spite of the fact that our isolation makes it extremely difficult for Kiwi exporters to compete in markets where there are no trade agreements. Free trade agreements help to improve national productivity by enabling firms to become more efficient as they seek to succeed in the face of stiff global competition. In addition, the importation of goods from overseas helps to improve the productivity of domestic firms, as the internal competition forces them to improve their performance. “There are plenty of things that could be done to lift the competitiveness of the New Zealand economy. For example, we now have a company tax rate that is above that of the median OECD country. Lower taxes on the returns to business investment are one of best ways of getting more such investment. We also already have one of the highest minimum wages rate, relative to median incomes, of any OECD countries. “Reforming our land use and planning laws could markedly lower the cost of housing, and help ensure that people and businesses can locate in the best locations. Some of the drivers of productivity growth are straight forward, such as improving infrastructure. With traffic congestion in Auckland estimated to cost the economy $2 billion a year in lost productivity, improving the country’s roading network is crucial. Reducing company tax was an election promise made by New Zealand First. With New Zealand now having one of the highest rates in the OECD, pushing for a reduction in company tax to prevent Kiwi businesses becoming increasingly uncompetitive, should remain a priority. Excessive regulation also erodes competitiveness and productivity. By increasing the cost of fuel and power, New Zealand’s Emissions Trading Scheme has forced up the price of all goods and services across the economy. The new health and safety requirements have significantly increased costs for some businesses, and the new food bill is forcing many fledgling enterprises to close. Labour costs will undoubtedly rise as a result of the increased influence of the unions. Further, according to the Ministry for Business, Innovation and Employment, increasing the minimum wage to $20 an hour, could destroy over 60,000 jobs and increase the economy-wide cost of wages by over $2 billion – pushing up the cost of goods and services even more. When the cost of transportation to overseas markets is factored in, it is little wonder that many potential exporters are unable to make the grade. The reality is that good intentions are not enough. If Jacinda Ardern is serious about lifting the country’s productivity growth, then she needs a policy re-think. Improving national productivity is a huge challenge, but the country’s future prosperity depends on it. Do you think that productivity will improve under the new Labour-led Government? With even more stumbling blocks & hurdles to jump, like James Shaws brainless promise to lead the world & make NZ carbon neutral ,which of course will make NZ even less cost efficient & will have zero effect on the climate. While Jacinda promises a minimum wage pay-rise unrelated to productivity. There will be no improvement in productivity as long as political interference in our lives remain.. A.G.R.